Wonderful "collage" of photos! Thank you, Tracey for sharing with Eric so we could see them. Beautiful and I am sure it must have been thrilling to be there seeing the light show and be at finish line of the tour de France! Well done Tracey and thank you! my family are "Le Tour" followers.....everyday.....for 3 weeks....and 21 stages.....and this was a spectacular way to celebrate 100 years of cycling in France.....done with style!!! Merci, Tracey! A wonderful collage. Ooh such a lovely post, Tracey - and Eric! When watching this on TV on Sunday night, I thought "Eric's going to be annoyed that he missed all this" but thanks to Tracey you didn't! 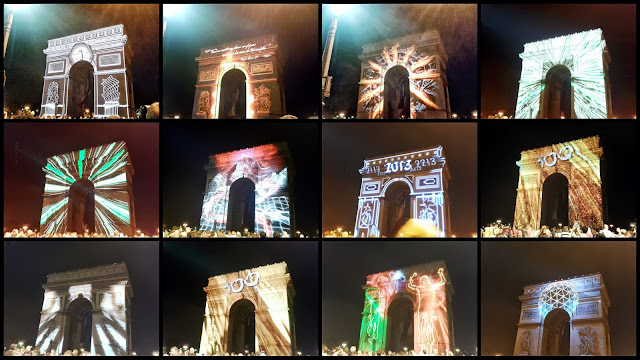 The special celebrations were for the 100th birthday of the Tour. No one does a light show like the Parisians. Very obliging of Stacie not Tracey to let you borrow these—and good for her for fulfilling her dream!